The Foodline® Piping System. It's aluminum. It's clean. It's simple. And it's backed with prompt, personal service. Aluminum makes it clean enough for the approval of the toughest health agencies in the country. It's easy to keep clean, too. Everything's flush. Smooth. Corrosion- resistant. And white FDA grade gaskets seal the joints. So there are no traps for bacteria. Anywhere. It's simple. Light. And easy to install. In fact, your own people can do it. We can tell you how. And we have all the right tools for the job. If you'd like, we'll supply them for you. We keep a complete stock. Always. Everything you'll ever need. And we know the fastest way to get it to you. The Foodline® Aluminum System is ideal for piping liquid sweeteners, edible oils, and shortening. It's non-toxic. Free from lead, tin, copper, brass and bronze alloys. It won't corrode like welded stainless steel with corn sweeteners. And it won't discolor or effect the taste of your product. Here's what we manufacture: couplings with FDA gaskets, ells, tees, reducers, end caps, flanges, adaptors, line strainers, valves, fabricated specials and much more to put a complete system together. All immediately available in 1" through 8" sizes. With adaptors to tie into any other type system. 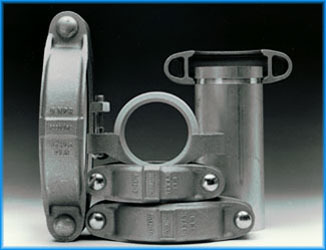 We can supply you with grooved aluminum specialties, aluminum pipe, butterfly valves, check valves, anti-drip valves, camlock fittings, stainless steel to groove adaptors. And storage tank UV air purifiers, tank vents, germicidal UV sterilamps, electrostatic and Absolute (HEPA) microbial filters. Plus replacements. With installation equipment and materials: grooving tools you can lease or buy, food grade lubricants, meter mounts, white FDA flange gaskets and tank manhole gaskets. We'd like to hear from you about your specific needs.